Much has already been said on the subject of the anti-religious message in the book(s) and how this has been played down (or dumbed down) for the film, but if you actually consider 'The Northern Lights' by itself, without reference to either of the books that follow, the message is not as clear or as anti-religious as some believe. Certainly, in the book, the Magisterium (i.e. the church) is portrayed as being a sinister, corrupt and possibly evil organisation. Similarly, in the film, the Magisterium are clearly made out to be the 'bad guys', although here the picture is painted in much broader brush strokes. But neither the book or the film goes as far as to suggest that there is any spiritual power behind the Magisterium, it could simply be an entirely man-made organisation. Of course, if you've read the other books, you'll know that 'The Authority' (i.e. God) is a character with a part to play, but that is not clear in the first book or film. Possibly the greatest achievement of the book is the concept of 'deamons', the animal-like personifications of the souls - and constant companions - of every human in Lyra's world. At the start of the book the concept is completely alien to the reader (or, in my case, listener) but Pullman conveys the concept so well that by the middle of the book the reader is truly shocked by the idea of separating the human from their deamon, so the experiments at Bolvangar seem really horrific. In the film the deamon concept is also handled well and must have been a nightmare for the animators. Perhaps the film should have emphasised the idea that humans and their deamons can't be separated by more than a few metres and that there is physical pain if this is extended. Also, the horror of the chamber in Bolvangar is lost in the film because no real explanation is given, there is no warning of what might happen, and it all happens so quickly that the importance of the scene is lost. Indeed, that scene is probably the film's greatest failing. Dust. The book and the film are all about dust. In the book, dust is something mysterious that Lyra is keen to find out about. In the film there isn't half the mystery about it and it is more just taken as being part of the world, but isn't really very interesting. One of the key things about dust in the book is omitted from the film (though may be at the start of the next one, I suppose) when Lyra and Pan discuss dust and decide that if the Magisterium and Mrs Coulter, etc. think that dust is bad, maybe it's actually good... But what dust actually is is not revealed in either the book or the film - its one of the mysteries that we hope will be revealed in future bits of the story. One of my favourite things about The Northern Lights was the concept of 'ambaric' power. This is mentioned several times but never explained in the book. Although (slight spoiler here) I was really disappointed by the discovery in the third book that ambaric and electric power were just the same thing, it would have been cool if they had turned out to have been different somehow. In the film, however, although it is never named, various things (airships, carriages, etc.) are apparently powered by cool, blue, gyroscopic machines, which I assume to be an imagining of ambaric power. Nice touch. One of the oddest decisions in the film was to change the sequence of events from that in the book. I was surprised that the re-ordered sequence of events worked quite well. 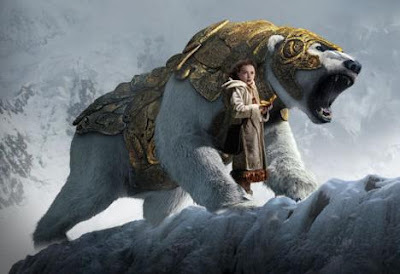 Thus the big fight at Bolvangar was moved to the end of the film, rather than the end of the middle section of the book, and the bear fight was moved earlier in the film rather than being towards the end of the book. The only thing contrived about the change in order was the explanation (or lack thereof) of why the raiders should have taken Lyra to the bear king as a gift. In the book it makes sense that they take her to Bolvangar, but taking her to the bears makes no sense. In summary, the book is a great read full of action and big concepts which are thought provoking and interesting. The film dispenses with much of the subtlety in the book and makes everyone clearly good or bad (except Lord Asriel, who remains ambiguous), but is a surprisingly faithful adaptation (faithful to the spirit of the book, if not the chronology), which is gloriously realised and reasonably gripping. I'd recommend both. By the way, I think the book(s) would have been better adapted into a TV series or mini-series, as the books are quite episodic in nature, but I guess that hasn't happened. Also, I really do recommend the audiobook versions of the books. They're read by the author himself, but all the dialogue is performed by actors, so it feels more like a radio play than a talking book. Very nice.